$1495 for the set. 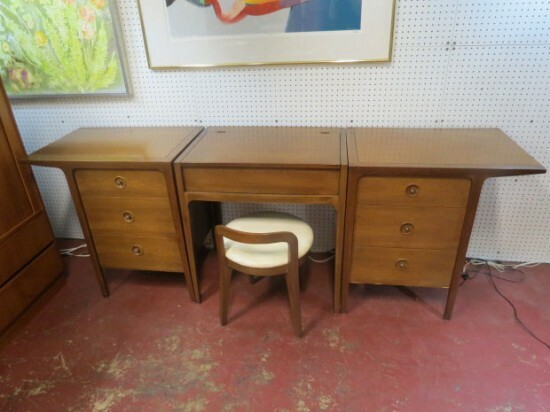 Vintage mid century modern walnut 4 pc modular vanity set by Drexel, c. 1958. Designed by John Van Koert for Drexel in 1958. Established in 1903, Drexel is a leader in transitional and modern furniture. 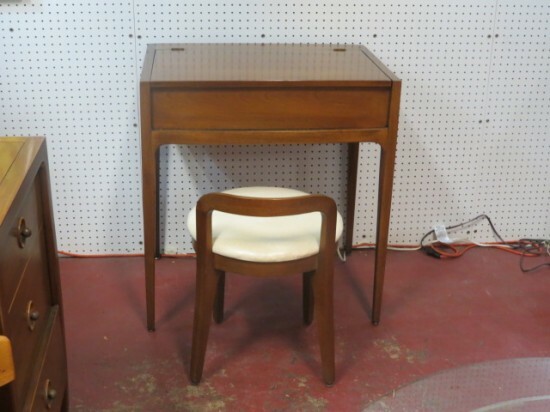 John Van Koert was a prominent New York furniture designer who helped promote the fascination with Danish modern furnishings in the 1950s. From their "Counter Point" line. 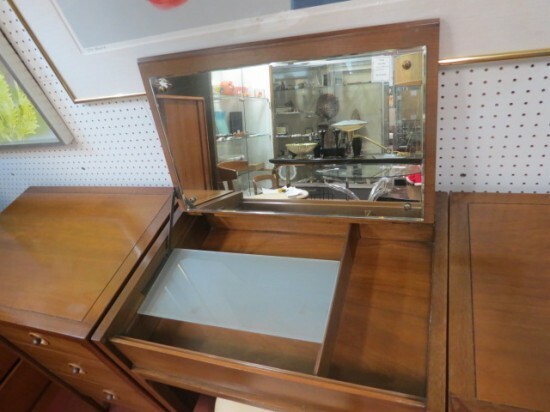 Center section has a lift up top with a mirror inside. Partitions inside with a glass tray. Vanity stool fits under. Stool has a curved open back with a cream vinyl seat. Each modular side of the vanity is a 3 drawer chest with extended top. Concave wood center in each drawer with a metal ball pull. Square darker legs surround the drawers and form the extended top. Unique design! 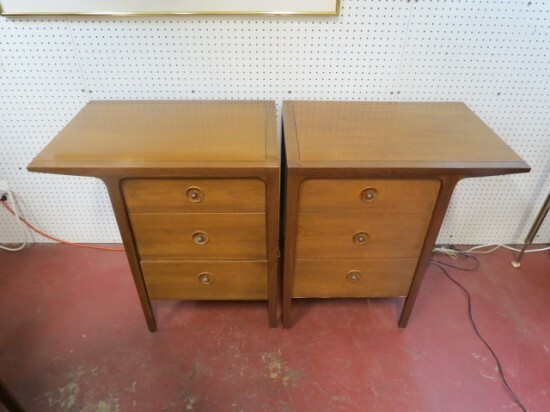 The 2 side pieces could be used together, away from the vanity or could be used as nightstands. Excellent condition. Stool measures 17in round, 22.5in tall. Vanity measures 28in wide, 20.5in deep, 30.5in tall. Side tables measure 28in wide, 20.5in deep, 30.5in tall. Entire piece together measures 85in wide. 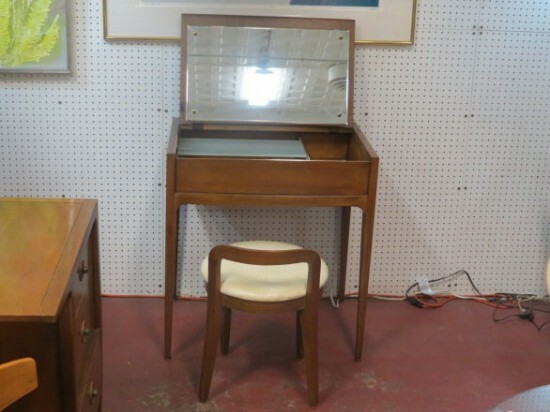 $1495 for the set. 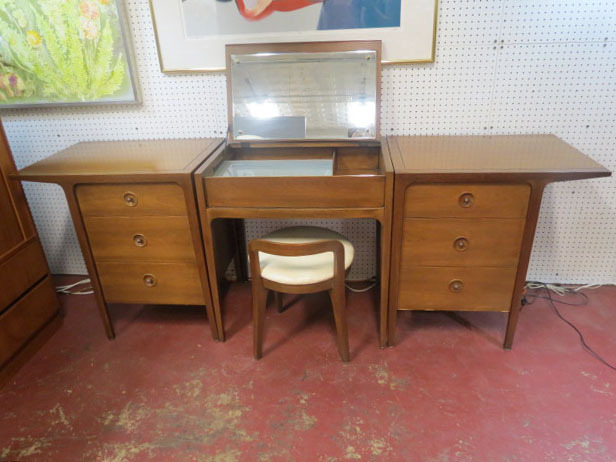 Vintage mid century modern walnut 4 pc modular vanity set by Drexel, c. 1958. Designed by John Van Koert for Drexel in 1958. 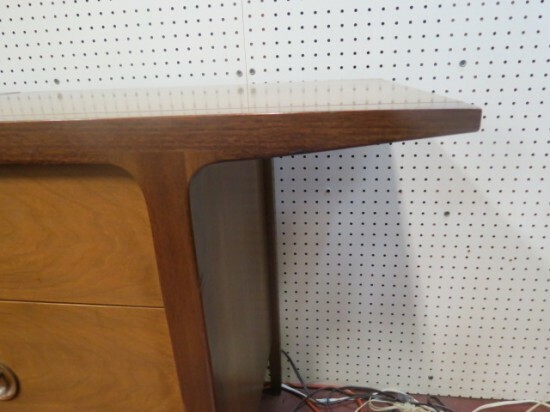 Established in 1903, Drexel is a leader in transitional and modern furniture. John Van Koert was a prominent New York furniture designer who helped promote the fascination with Danish modern furnishings in the 1950s. From their “Counter Point” line. Center section has a lift up top with a mirror inside. Partitions inside with a glass tray. Vanity stool fits under. 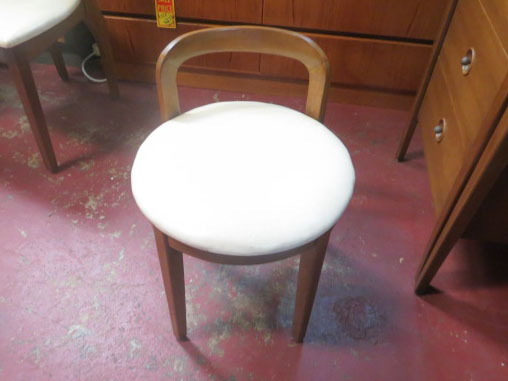 Stool has a curved open back with a cream vinyl seat. Each modular side of the vanity is a 3 drawer chest with extended top. 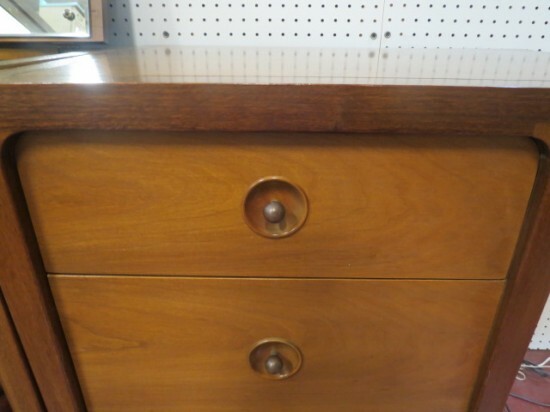 Concave wood center in each drawer with a metal ball pull. 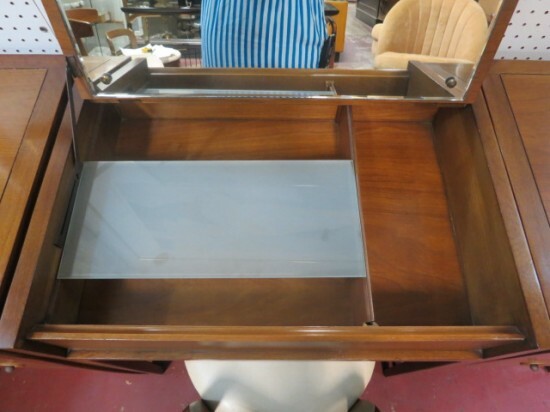 Square darker legs surround the drawers and form the extended top. Unique design! 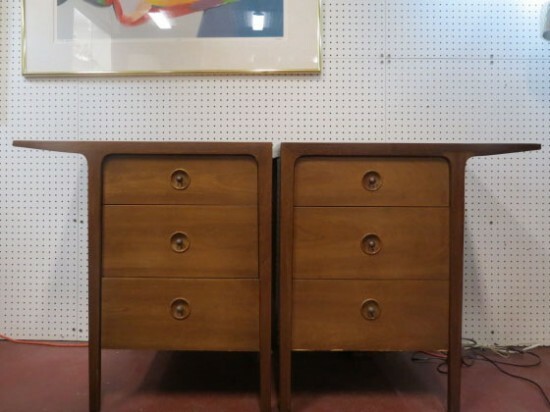 The 2 side pieces could be used together, away from the vanity or could be used as nightstands. Excellent condition. Stool measures 17in round, 22.5in tall. Vanity measures 28in wide, 20.5in deep, 30.5in tall. Side tables measure 28in wide, 20.5in deep, 30.5in tall. Entire piece together measures 85in wide.